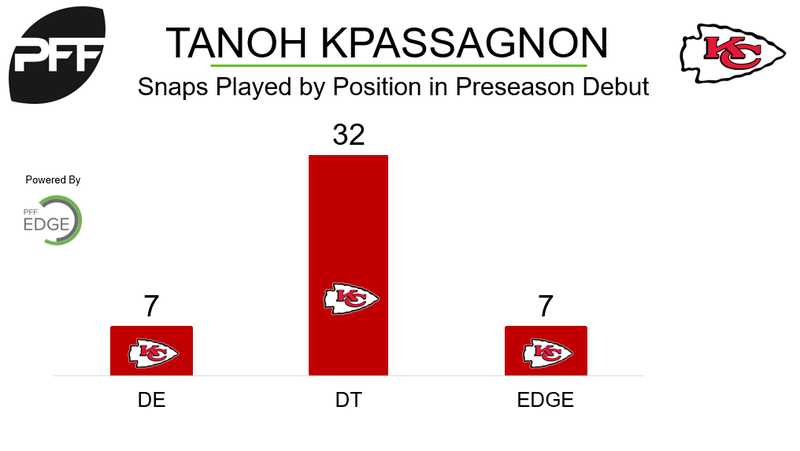 The Kansas City Chiefs are using second-round interior defender Tanoh Kpassagnon more as an edge player than previously anticipated, and Matt Derrick is reporting that he’s been working with the linebackers in practice. The 6-foot-7, 289-pound rookie from Villanova played 46 snaps Friday against the 49ers, with seven of those snaps (15 percent) coming from the edge. It was a nondescript debut for Kpassagnon, with a 75.5 pass-rushing grade and a 54.6 run-defense grade while generating two assisted tackles.